When you buy beef at the supermarket, you face the choice of purchasing Certified all natural versus conventional beef(Certified All Natural is almost impossible to find in a grocery store). To bear the certified all natural food label the product must adhere to the standards of the All Natural Food Council of North America and the USDA. “Certified all natural: and conventional beef differ in more than just price and nutritional value; they also have distinct environmental and animal welfare impacts. The key environmental issue concerning conventional beef rearing practices is the concentration of large amounts of livestock manure in a small area. 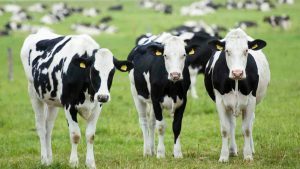 According to the U.S. Environmental Protection Agency, livestock in the United States produce 6 to 10 times the amount of waste as humans, creating challenges for safe disposal. Livestock wastes contain dangerously high nutrient levels, pharmaceuticals and pathogens that pollute the soil, waterways and air. Certified all natural beef farmers must adhere to a higher standard then the conventional farmers which is superior for the overall environmental impact specifically soil, and air quality. Due to the poor and disgusting living conditions of the cattle on conventional beef farms the farmers have to manage disease with major doses of antibiotics. When the cow is given such high doses of antibiotics we end up absorbing them when we consume the conventional beef. All natural farms do not use antibiotics, therefore the beef is healthier and safer to consume. Animal welfare issues surrounding raising animals for food tend to focus on living conditions. The USDA addresses the stress beef cattle experience in conventional feedlots and acknowledges that access to pasture represents an ideal in terms of both animal welfare and environmental stewardship. They note that animals experience stress levels, which also increase the risk for disease and poor living conditions. All natural standards forbid the continuous confinement of beef cattle on feedlots. They do permit the use of feedlots temporarily during the non-grazing season, as long as animals are not crowded and do not have to compete for access to food and water. These farms must accommodate the cattle’s natural behaviors and living conditions. The ways the animals move and what they are fed has a major impact on the overall quality and integrity of the beef you are eating. All natural cattle farms avoid fattening agents like corn and soy, not only are these terrible for the health of the cattle but they also decrease the overall nutritional value of the beef. All natural beef feed include grain, hay and grass. The Nutrition Journal states that natural beef is lower in harmful unhealthy fats and higher in omega 3 fats, which are overall better for weight management and cardiovascular health. Conventional feedlots do not allow for any movement or access to the outside for the cattle, they do not develop naturally and the quality of the beef reflects that. All natural beef cattle have more opportunity for natural movement and they have access to the outside natural environment. Some research shows that if the animal is under a high state of stress they are more prone to disease and the meat is also lower quality and less nutritious. Due to the high demand for conventional beef for fast food and the restaurant industry the American farmers are not adapting to all natural farming practices very quickly. The only way that the process will speed up is if the consumer shows a major interest in all natural beef and is willing to pay a higher price for the better quality and nutrition of the beef. The existing supply of the premium meats we serve in our local restaurants is unable to meet our growing demand as a country. For example- Chipotle Mexican Grill recently decided to outsource their beef to Australia, the quality beef in the United States could not keep up with the demand in their restaurants, 45 million pounds of the domestic beef purchased in 2013 was not enough for Chipotle to meet their customers demands. The economical impact may have something to do with the Paleo, low carb, meat is good trend. The exciting part for health enthusiast is that not only are consumers wanting to eat more protein, they want quality protein that has the best nutritional value and processing quality. We are finally slowly moving towards a time where our country is realizing that our health is being affecting by convenient foods and farming practices. Use your spending practices as your voice, and do not settle for the cheaper and unhealthy alternative. If enough people do that then the standards will shift and we will have better farming practices that will help reduce disease and improve overall health.